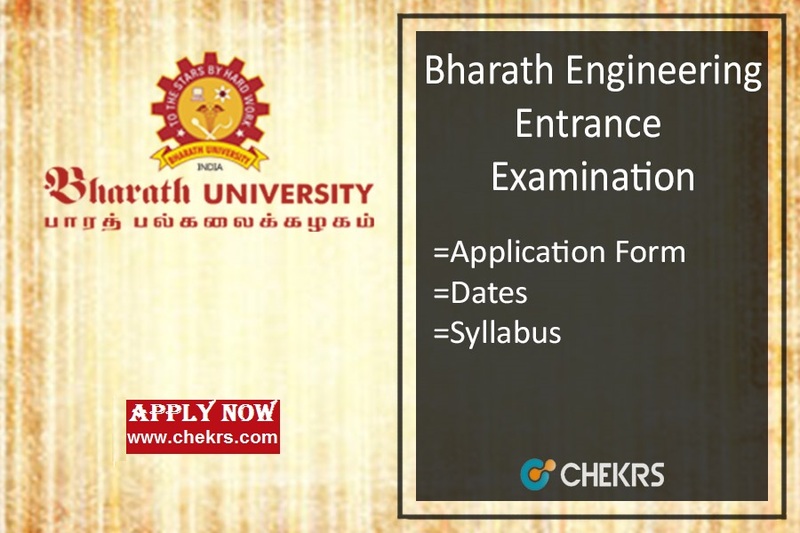 Bharath University Admissions 2018 (भारत विश्वविद्यालय प्रवेश): The Bharath Institute of Higher Education and Research Chennai conducts Bharath Engineering Entrance Examination. The BEEE Exam 2018 will be conducted in two phases. In the first phase the exam will be conducted in only offline mode and in Phase second, the exam will be conducted in both online & offline modes. The students are required to submit the Bharath University Application Form 2018 before the due date on the official website. The forms will be released in the month of January. The students have to submit the BEEE Application Form 2018 before the last date of the submission. The students will get the apply online link on the BEEE Official website. We will provide here the direct link for the submission of the admissions form after the official announcement. They just have to follow some precise procedure for the submission of the form in online or offline modes. Steps to submit Bharath University Application Form. Then they have to register themselves on the website of the University. They will be provided with a Uniques id and password. Login with that id password. Now fill all the remaining details in the form. As you click on the submit button, the payment page will be opened up. Pay the required application fee via any of the online banking modes. The students have to access official website and download the application form. Now they are required to fill all the details with a blue ball or gel pen. Enter the details correctly and carefully. Now attach a colour photograph along with the form. The aspirants are advised to ignore overwriting in the form, this may lead to the cancellation of the form. Now pay the fee via demand draft in favour of the University. Send the form to the below-given address. The aspirants are required to pay Rs.900 for the application form. The fees can be paid through online banking modes. Students can also make the payment through demand draft in favour of the University and send it to the mentioned address. NRI and Foreign Nationals are not eligible for the exam. Must have complete Plus 2 from recognized Indian board. The students passed/ appearing in 12tht class from any recognized board can apply. The aspirant must have physics, chemistry and Mathematics as their compulsory subjects. Diploma candidates can also apply for the BEEE 2018. Subjects: English, PCM or PCB for some streams. The students in a large number are going to appear for the exam. So they will require BEEE Syllabus Pdf for their preparations. The syllabus includes Physics, Chemistry, Biology, Mathematics and English subjects. The Topics for each section will be provided in brief so that students can cover all the sections easily. The aspirants who will practice sample questions of the exam on regular basis will have more chances to qualify the exam easily. The students who are applying for the biotechnology streams will get questions from the biology subject as they have chosen it in their 12tht class. For feedback and more queries regarding Bharath University Entrance Exam Syllabus 2018, you can contact us by commenting in the comment section given below.